AUCKLAND (Pacific Journalism Review/Pacific Media Watch): The statistics globally are chilling. And the Asia-Pacific region bears the brunt of the killing of journalists with impunity disproportionately. More than 12,000 people have reportedly been killed – according to Amnesty International, although estimates are unverified – in the presidential-inspired purge. Almario-Gonzalez’s colleague, award-winning photographer Fernando G Sepe Jr, has also contributed an associated photoessay drawn from his groundbreaking ‘Healing The Wounds From the Drug War’ gallery. 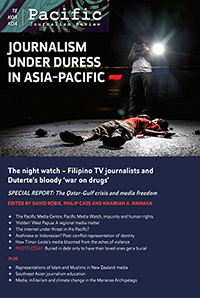 The “Journalism Under Duress in Asia-Pacific” seminar examined media freedom and human rights in the Philippines and in Indonesia’s Papua region – known as West Papua. The issue has been edited by Professor David Robie, director of the PMC, Khairiah A. Rahman of AUT, and Dr Philip Cass of Unitec. The designer was Del Abcede.